Bailey first joined Moloney Securities Asset Management in 2012, and became Portfolio Manager in late 2018. Bailey has profound experience in both public securities market and Private Equity/Venture Capital. Bailey serves her clients with her expertise in financial due diligence, portfolio construction, investment operation, fund administration, and data management. Bailey received her CFA designation in 2017, and is now a licensed CPA in California. 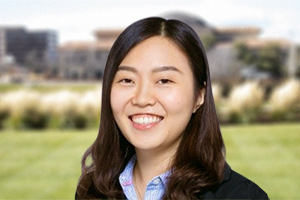 She originally came from China, and graduated from Washington University in St. Louis with a Master of Accounting degree in 2011. Shakespeare wrote in Julius Caesar that “There is a tide in the affairs of men. Which, taken at the flood, leads on to fortune”. Bailey’s passion is helping clients to recognize, prepare for, and actively grab this tide. It’s an honor to ride along with clients and help them achieve their greatest purposes in life.